Privacy in Paradise! Spacious, secluded family villa, close to the shoreline. Stunning views of the tropical sunset coast. Resident staff, private infinity pool, jacuzzi. Book a stay today. 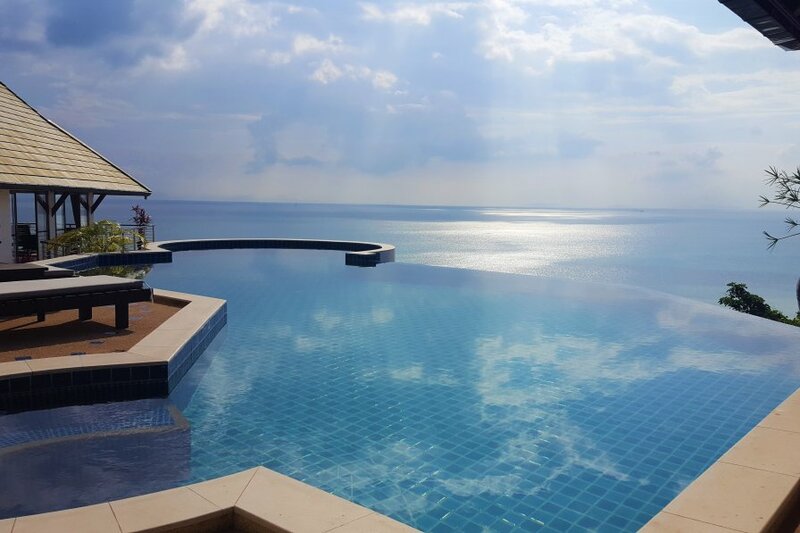 This spacious holiday villa is located on the sunset coast of tropical Koh Samui, 2 kilometers from the Island Capital of Nathon and 25 minutes from the airport, set in 2500 square meters of secluded hillside gardens, in Ban Bang Makham. We can sleep 10 in four large bedrooms for family flexibility. Only a few hundred meters from the sea, offering superb panoramic views of the azure waters of the Gulf Of Siam, marine activity of Nathon Port, nearby tropical islands and the rainforest, Samui Sunset Pavilions promises a fantastic holiday. The 650 sq.m. designer villa provides four air conditioned Bedroom En-Suites with views of the tropical waters, a balconied central tower containing a living area on the ground floor, a Chill Out Budhha Lounge on the first floor and a Sundowners Bar at the apex. The views from every room can only be described as astounding! A private driveway sweeps down to the Entrance Hall and Lounge with wall to wall windows overlooking the splendid Infinity Pool, Sun Terrace and Jacuzzi. Built as a home, this Private Residence contains a fully equipped European Kitchen, a Sauna and a poolside Sala, also with magnificent Sea views. Two Bedrooms have Private Balconies and Jacuzzis, another opens directly to the Pool Sun Terrace and the fourth to the Waterfall Terrace, furnished in a fusion of Contemporary Asian and Thai Style. In addition to the air conditioned bedrooms, fans are located throughout the villa and each bedroom suite has ample ventilation, should you prefer to enjoy the cooler on shore sea breeze of the hillside at night. We believe a car is essential to enjoy your holiday, although you may find, like us, that it tends to sit in the car port quite a lot and many guests, in fact the majority, now rely upon our short term mini bus and driver hire.! Just down the road along the beach are several waterside restaurants, serving Thai food and Western food at very decent prices. There is a kite board school in Nathon, 2 k away. The Four Seasons Hotel is a few minutes by car, where you will find an excellent restaurant, beachside cocktail bar and Spa, all at prices better than you may expect. Even nearer are the Mai Samui Resortel and the Passage, all with fine bars and restaurants. Nathon with its fine shopping opportunities is 2 kilometers, Nikki Beach Resort is a little further. In Nathon you can book a variety of tours, or this can be handled on your behalf. There are jungle, island, waterfall, elephant tours, kayaking, power boating, sailing, a tiger zoo, butterfly farm, endless beaches, sunset cruises, national marine park trips, two 18 hole and 1 nine hole golf courses. Chaweng Nightlife is 20 minutes away with many restaurants, bars, go go clubs etc. Our manager will be able to advise. SSP has 4 bedroom en-suites with king size doubles and an additional two single beds for family flexibility. (Shown as sofa beds in the detail). My young grandchildren stay here regularly and we have many families stay with toddlers- so the villa is suitable for children but with balconies and a pool they require parental supervision. As part of the Samui Green Island Policy to minimise the islands carbon footprint and preserve scarce resources, power consumption is charged as per meter use. car port plus additional parking space. child stair gates.